3 Stars from Chicago Tribune! Eventually, the restaurant team of Kevin Boehm and Rob Katz will open a restaurant that fails to live up to expectations. Mostly because expectations for this everything-touched-turns-golden duo keep rising. How can they not? From Boka to Girl & the Goat to Perennial ( re-christened Perennial Virant, and I suppose — sigh — that will be terrific as well), these guys have been on a roll. Make that a lobster roll, now that GT Fish & Oyster (which takes its name from chef Giuseppe Tentori) is playing to capacity crowds. The room is gorgeous inside, evocative, Tentori likes to say, of a yacht belonging to a James Bond villain. Polished ivory wood slats adorn the walls and ceiling; the teakwood floor in the dining room resembles boat planks. There are free-standing tables, a banquette backed by a chalkboard wall and two massive dining-room tables used for communal seating; over in the bar/lounge area, a boomerang table seats another dozen walk-ins, which helps explain why reservations are so hard to get. The small-plates menu is a nifty balance of the expected — required elements such as clam chowder, crab cakes, smoked salmon — and the wholly unexpected. Snapper carpaccio falls into the latter category, a silky slab of pink fish topped with curls of heart of palm, pickled ginger and fried lotus root; so do the brandade croquettes, tiny, mustard-aioli-dabbed nuggets topping a fennel-orange salad like so many meatballs. A foie gras and shrimp terrine, laced with Sichuan peppercorns and paired with apricot chutney, is as interesting a surf-and-turf combo as I’ve encountered in some time. 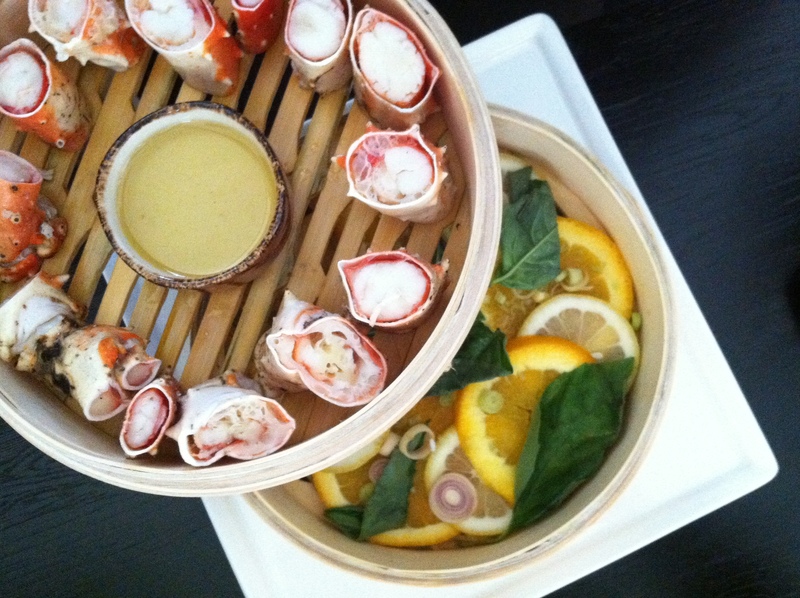 The king crab legs presentation is, well, genius. The legs are cut into 2-inch segments, resembling shell-coated crab medallions, and cooked in a bamboo steamer. The steamer’s lower section contains orange, kafir lime, lemon and lemongrass, and when the lid is removed at table the fragrance is wonderful (the citrus notes don’t penetrate the crab meat; it’s strictly an olfactory treat). At $42 (which was market price that day), the crab is far and away the priciest item on the menu (the next highest is the $22 lobster roll; everything else is $16 or less), but arguably worth the splurge. Another indulgence, though a mere $9, is the lobster mac and cheese, featuring firm lobster nuggets amid orechiette pasta, English peas, a three-cheese cream blend and toasted brioche crumbs with a bit of lemon zest. The portion’s rather small, but there’s no dearth of richness. Mussels, served in a cast-iron pan set into a hardwood plank, are delicious, as is the roasted-tomato and basil broth supporting them; happily, there are pieces of ciabatta ready to soak up the yummy liquid. Perfect-texture crawfish frolic among cannellini-bean tortellini, pieces of prosciutto and lobster creme fraiche. Fish tacos — sometimes mahi, sometimes rockfish — benefit from a smoky chipotle aioli slathered onto the corn tortillas, while a sprinkling of powdered chicharron is reminiscent of an exotic sea salt. Now that soft-shell crab season is upon us, I’d be remiss if I neglected to mention GT’s fine version, which bathes the crab in a sweet miso vinaigrette, over a sweet and peppery strawberry-arugula salad. The good news for frustrated fans (tables are tough to get here) is that GT has added lunch hours, serving a truncated version of the regular menu augmented with such sandwiches as a tuna BLT, and even a burger. I rarely sound the “save room for dessert” alarm, but pastry chef Kady Von’s creations so perfectly match the GT concept — small, light-tasting, familiar with a slight twist — that it would be a shame to skip them. Key lime pie arrives in a jar, the layers of lime-lemon curd and soft, torched meringue separated by a gingersnap-crumble middle. A cube of panna cotta, fortified with a little cream cheese, rises above a scattering of graham cracker crumbs and fresh peach and cherry garnishes. Strawberry shortcake, made with creme fraiche and basil-macerated strawberries, picks up extra tartness from a quenelle of strawberry sorbet. The meal ends with lovely parting gifts — bottles of Tentori’s signature green and red hot sauces (“Burn” and “Smoulder,” respectively). “They’re my version of mignardises,” the chef says. These are less fattening. And they last a good deal longer. Watch Phil Vettel’s reviews weekends on WGN-Ch. 9’s “News at Nine,” CLTV and atwgntv.com/vettel. 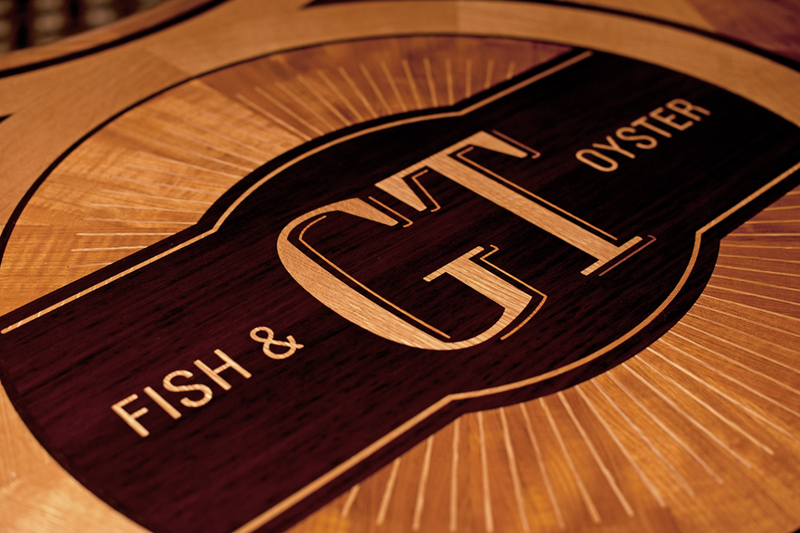 This entry was posted on June 21, 2011 by GT Fish and Oyster. It was filed under Uncategorized . way to go chef!!! cheers to you and the boys!